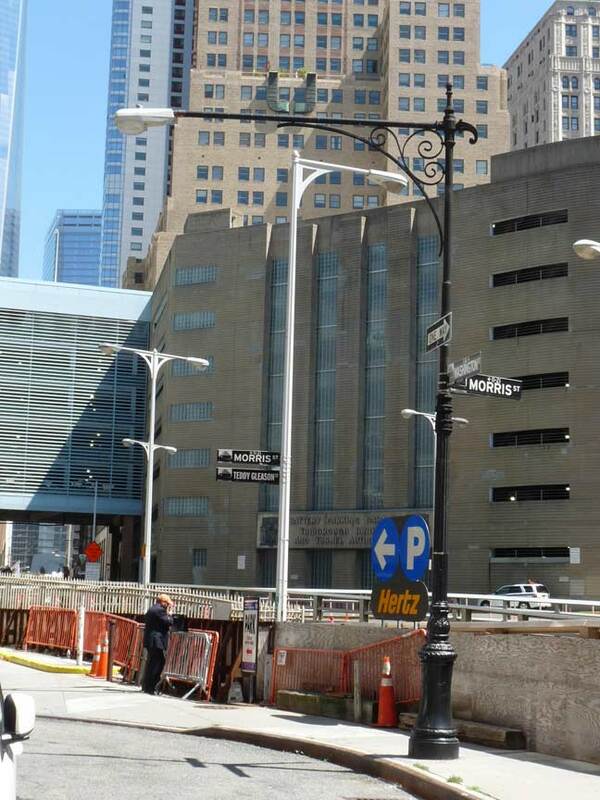 Word comes that a pair of classic NYC lampposts from an earlier era have been torn down, at least temporarily. This Corvington at Morris Street and a stub of Washington left over from when the Brooklyn-Battery Tunnel was built here in the 1940s has been torn down, though an identical specimen a few feet away on Morris still survives. Along with a group of Corvs on Greenwich Street east, on the other side of the tunnel, it’s one of a batch of surviving Corvingtons from their original 1915-1949 era, though they have frequently appeared in retro versions beginning in the 1980s. Will it be put back in place later? We’ll have to watch and see. UPDATE, 1/28/19: the lamp is back in place, albeit with th sodium lamp still on it. Similarly, ongoing construction in Tribeca at 6th Avenue and Walker Street has forced the hopefully temporary loss of this compromised early 20th Century Twin. It has long missed its finial, and in the 1980s its incandescent fixtures were replaced with Holophane buckets. 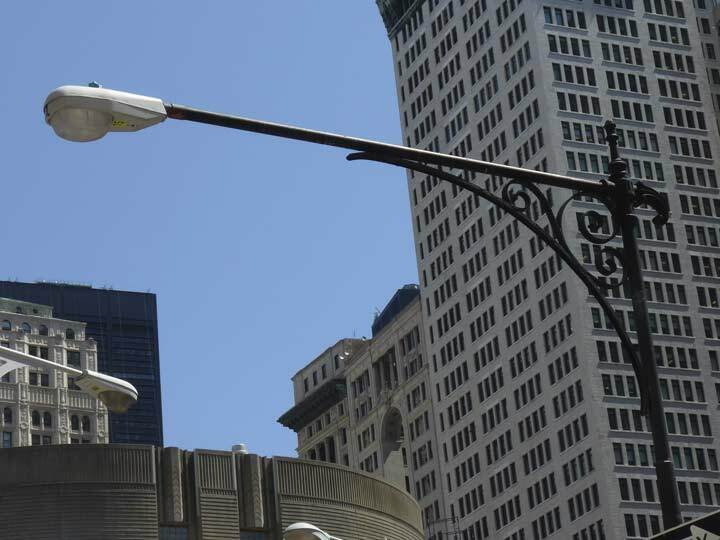 Twins were the first genre of cast iron streetlamp to appear in NYC streets. 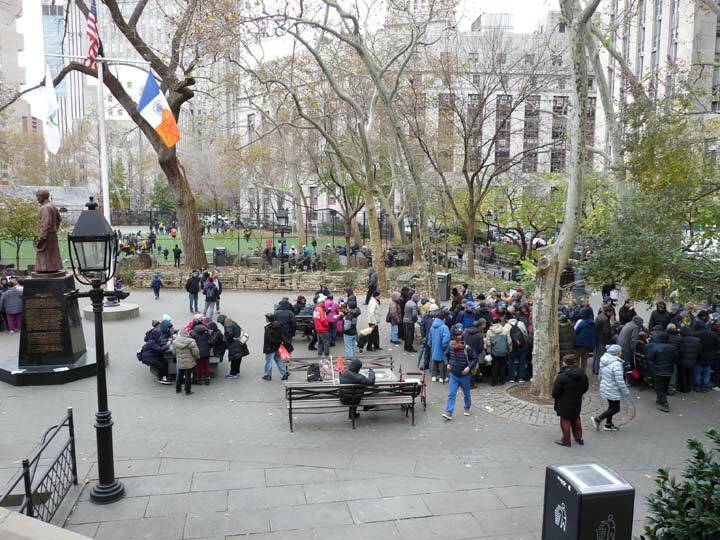 They were first installed (in a different style) on 5th Avenue beginning in the early 1890s, and 5th had been their chief bastion until 1965, when a new genre of double Deskeys, used only on 5th, replaced them. Other than that, the Twins were used relatively sparingly, though they did turn up on broad roads with central dividers, like Queens Boulevard and, I believe, Bruckner Boulevard in the Bronx. 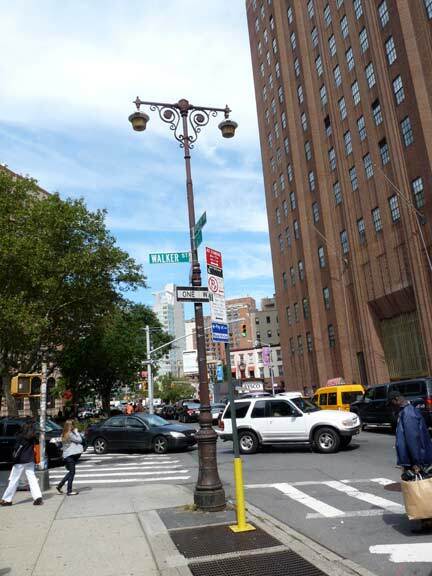 This Twin was installed no earlier than 1928, the year 6th Avenue was extended south into Tribeca. I don’t have any photos of this stretch of 6th from that era, so I wonder if this was a one-shot, or lower 6th was lit by a flock of Twins. Will these classics return to their rightful places? Dunno–we’ll see. I remember the twins used on many of the broad, divided roadways in Queens besides Queens Blvd. Union Turnpike and Francis Lewis Blvd. are two that immediately come to mind. In The Bronx twins were on the Grand Concourse, but not Bruckner Boulevard, which had its own Art Deco Triboro lampposts. In Manhattan, upper Broadway above Columbus Circle had a unique group of twins with extra-fancy touches on the tops. I’m sure there were many other example of twins on other divided roadways, but those came to mind right away. The lamp is back in place, it was temporarily removed so TBTA can do some repair work on the retaining wall next to the entrance plaza to the BBT. It sill has the Cooper Lighting HPS fixture.